Can you sing in tune? Learn to sing (or play an instrument) accurately in tune with HotPaw Sing-inTuna's color-coded pitch graph. Sing-inTuna uses the built-in microphone on your iPhone or iPad to analyze and help you visualize if you are singing, or playing a musical instrument (such as a violin), precisely on the right pitch. 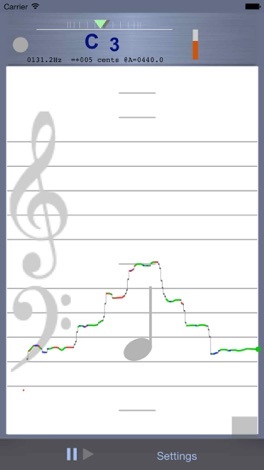 It graphs pitch on a scrolling graph resembling a musical Grand Staff. Tones that are on-pitch (+-20 cents) are colored green; notes slightly sharp: red; notes a pinch flat: blue. You can also display an optional pitch frequency spectrum of your voice to see your timbre. Sing-inTuna requires a quiet environment with no accompaniment or harmony, and monophonic pitches that are at least a quarter second long. The pitch range using the built-in mic is about +-2 octaves from middle-C, depending on microphone use, loudness, and timbre. Note: This app produces no sounds and shows no sheet music. It only listens so that you can see your pitch, and how well your pitch matches that of a well tuned equal-temperament instrument.